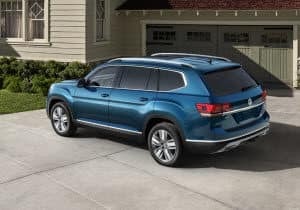 If you’re in the market for a stylish but spacious SUV that delivers comfort for the whole family, you’ll want to consider the Volkswagen Atlas. It’s the largest offering from Volkswagen, newly released for 2018, and it comes with tons of standard and available features to make your drives around West Valley, Murray City, and Orem more convenient and luxurious. This 2018 Volkswagen Atlas review from the team at Volkswagen Southtowne will give you all the information you need to decide if the Atlas could be the right fit for you. The 2018 Atlas comes standard with a 2.0L turbocharged engine that produces 235 horsepower, and is EPA-estimated to achieve 22 city/26 highway MPG*. The available 3.6L V6 engine produces 276 horsepower, and is EPA-estimated to achieve a fuel efficiency rating of 18 city/25 highway MPG**. Both engines come paired with an 8-speed automatic transmission. Tiptronic® mode allows you to make manual shifts and put yourself in more control while driving. Front-wheel drive is standard, and 4Motion® all-wheel drive with Active Control is available, and allows you to switch among four different driving modes with the turn of a dial, so you can handle any weather or road conditions with ease. Your options include Dry, Rainy, Snowy, and Rough. Inside the Atlas, you’ll find three rows of seating, with room for seven. The third-row seats are split-folding 50/50, and the second-row folds 60/40, so you can create versatile combinations of passenger and cargo space. Behind the third row of the new VW Atlas, you’ll find 20.6 ft3 of cargo space. Fold the third row forward, and you’ll have 55.5 ft3 of space, and with both the second and third rows folded, you’ll have access to a total of 96.8 ft3 of cargo capacity. Cloth upholstery is standard, and the second-row seats slide backward and forward for easy access to the third row, and to adjust legroom. The seats can also tilt forward, even with a child safety seat clipped in. All seats in the Volkswagen Atlas are supportive and comfortable, and offer plenty of room to stretch out. Climb into the 2018 Atlas, and you’ll find tons of standard technology features. A panoramic sunroof, 6-speak sound system, and 8-inch touchscreen are all standard. The infotainment system comes with standard satellite radio, a rear-view camera, Apple CarPlay™, Android Auto™, and more. As a safety bonus, you’ll also get standard automatic post-collision braking. Test Drive the 2018 VW Atlas at Volkswagen SouthTowne today! If you’d like to get behind the wheel and try the Atlas for yourself, contact Volkswagen SouthTowne to schedule your test drive. Soon, you’ll be hitting the streets of West Valley, Murray City, and Orem in your brand-new Volkswagen SUV! *22 city/26 highway MPG (2018 Atlas S 2.0L, 8-speed automatic transmission). EPA estimates. Your mileage will vary and depends on several factors, including your driving habits and vehicle condition. **18 city/25 highway MPG (2018 Atlas Launch Edition 3.6L, 8-speed automatic transmission). EPA estimates. Your mileage will vary and depends on several factors, including your driving habits and vehicle condition.